1. Buy after Christmas. Pick-out decor items you want during the season, but don't purchase anything until after Christmas. This is my personal #1. I've mentioned it before, but I just can't justify spending much on holiday decor because it only stays up for a month. Everything, and yes, I mean everything, we have purchased for Christmas was 50-80% after the holidays. That includes our tree, all of our ornaments, and even a bag of pinecones I purchased to make this garland. 2. Fill containers with stuff. Eloquent, eh? This is the main thing I do when decorating our house for Christmas. I use "filler" that I have purchased after Christmas in any container that I have sitting around the house. Example 1: random fake berries and pine cones in an old basket. Example 2: mason jars filled with cinnamon sticks and tea candles. Example 3: pine cones in an enormous glass vase. Example 4: The ubiquitous (and still wonderful) Anthro-inspired snow scene in a bottle. You can be cheap like me and wait to buy your trees after Christmas for pennies and use stuffing instead of fake snow. 3. 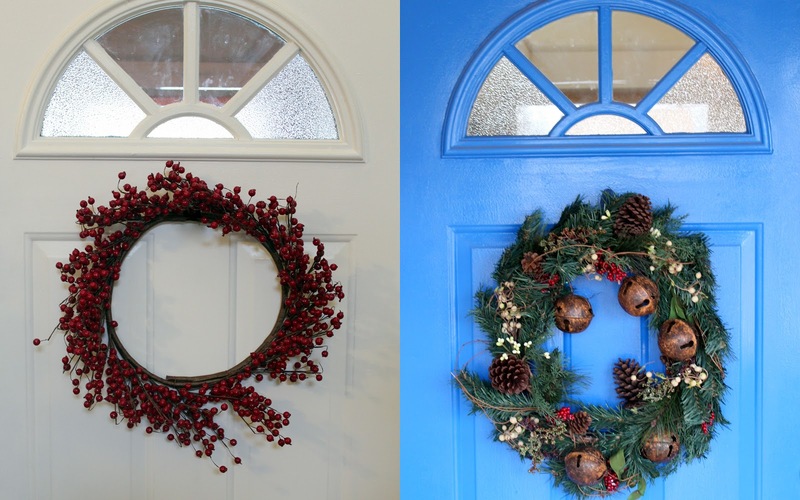 Wreath-ify. I love wreaths. While I always have one on the front door, during the holidays I put them all over the place. Below is a picture of the outside and inside on the front door. You can also see above (example 3) that I placed a small wreath on a stack of books. That's what I call wreathifying. Example 2: White candles grouped together feels very wintery to me. And it's also super-affordable. You can also wrap the candles with ribbon or twine to make them more festive. 5. Hang ornaments from things. Your tree is a good start, obviously. But look around your home for other things that you could hang ornaments from. In our house it's our chandelier and a couple of tree branches on the windowsill. I just use whatever leftover ornaments I have. 6. Incorporate holiday artwork. 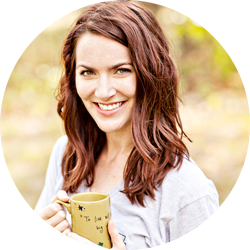 I usually replace a couple of pictures with some free printables from people who are talented in the design department. Joy Printable and Merry Christmas Printable. What about you? 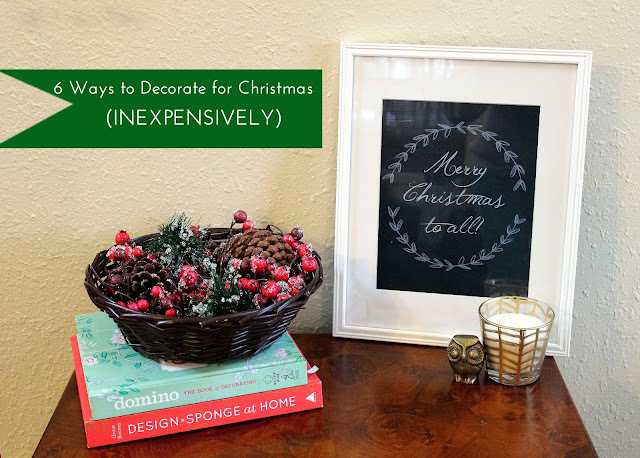 Do you have any other ideas for decorating inexpensively for the holidays? Do you do any of the above in your home? Great ideas. Very cute decor! wreath-ify is now my new favorite word!!! Great ideas!! Love the cinnamon sticks in the mason jars...I will definitely need to try that. This was my first year decorating my apt for Christmas so unfortunately I had to buy stuff now. I got most of my stuff from Michaels and everything seems to be on sale there (50%-60% off), plus they always have 40% off coupons. SO I managed to get decor on sale before Christmas! Although, I only started decorating 2 weeks before Christmas so that might be the reason! I'm glad you were able to get good deals before Christmas! The first year decorating is really hard - we had a teensy tiny tree our first year because we didn't want to buy a big one! Since stores start putting out Christmas stuff so early, maybe the sale cycle is starting early too. I've been trying to avoid stores like Hobby Lobby and Michaels, but it sounds like I might get some good deals right now! Everything looks very festive. Love the jars with the tea candles & cinnamon sticks - must also smell nice when warm. I placed tea candles in mason jars & added wooden numbers from Michaels, painted them red & tied ribbons to the jars as a sort of advent thing...all lined down the table as a faux lit up runner - looks magical. Oh I love that idea! I never thought of using Mason Jars as an advent calendar. Very cute! I have pine trees in my yard, so starting in October I am on patrol (ok, my kids are on patrol) for "good" specimens to use around Christmas. In addition to filling giant glass jars with them, you could make garlands, throw them in a bowl, or even spray paint them for EXTRA FESTIVENESS. Hobby Lobby already has all Christmas stuff 50% off. That hurts me. I'm jealous you have access to pine trees - that was one of the other things I thought of as being "free decor," but I would have to go hunt for some! And Epsom salts is a great idea for snow too! And yes, it is so crazy that all the Christmas stuff is already on sale! They shouldn't put it out so early!! Hi Ada! I love filling jars with things - inexpensive but still really cute! I really love wreath making too. It didn't happen for me either - sometimes there is just not enough time before Christmas! those are good tips! i think i follow most of them, but should look at incorporating holiday artwork more.